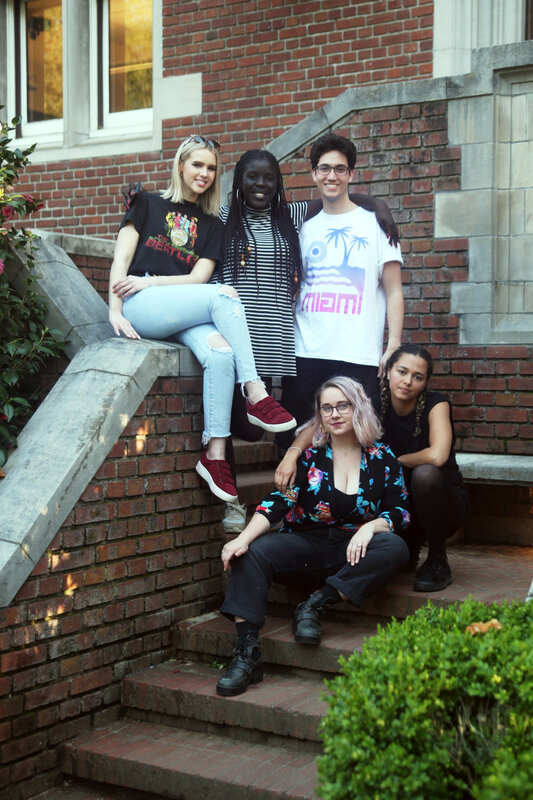 The Grail asked Renn Fayre Czars Leensa Gheneti, Aminta Gueye, Brenna Intemann-Milligan, David James, and Kieran Nugent to fill out a questionnaire online regarding their experiences as Czars and all things RF2k18. Their answers are copied below. Renn Fayre Czars (back row) Kieran Nugent, Aminta Gueye, David James, (front row) Brenna Intemann-Milligan, and Leensa Gheneti. Photo by Claire Pask. Grail: Why did you want to be a Renn Fayre Czar? Leensa: Serving the Reed community is the greatest honor in the world. Aminta: I couldn’t resist being on a team with such incredible people. Brenna: I promised my fave fisher in the whole world, David James. David: I was a prospie with Jack Johnson who also grew up in Boise. He was a former Renn Fayre Czar and took me to visit the office, and I thought being a Czar seemed like it might be fun. Also, my first year at Reed I promised Brenna that I would be a Renn Fayre czar with her and I wanted to keep that promise. Kieran: I was born to do this. G: Favorite failed Renn Fayre theme idea? G: Best thing about being a Czar? L: Meeting such cool people. A: Being able to serve the Reed community. B: Free advice from such generous people. K: All the free milk. G: Hardest thing about being a Czar? A: It’s too much fun, I can’t imagine what this year would be like without this job. G: What has been your biggest accomplishment as a Czar? A: Picking such a great theme. B: Not canceling Renn Fayre. K: My Spring Fall Outfit. G: Any tips on how to make the most out of Renn Fayre? L: Go to the bug eating contest!! A: Drink a ton of water and don’t forget to wear sunscreen! B: Volunteer! It’s a great way to structure your weekend ;) Check out our website: rennfayre2k18.com. D: Take some introvert time when you need it. G: Favorite past Renn Fayre project? B: Lawn letters. They’re a classic. G: Favorite Renn Fayre activity? A: Dancing in the lodges. B: Softball Sunday and beer. D: Softball, on Sunday in particular. G: Sum up your Czardom in one word. Older PostWhat is Renn Fayre, Anyway?